Tech Square is transforming Midtown, providing a reference point for investors used to seeing other technology hubs. Photo by Georgia Tech's real estate office. Laurens Eckelboom gives Dutch chamber members a tour of ParkMobile’s Midtown offices. Photo courtesy of NACCSE. “This is the hottest bar in Midtown after 5:00 on Fridays,” Laurens Eckelboom, the Dutch-born chief strategy officer for the company, told a recent group of visitors from the local Netherlands-American chamber. Part of the fun is a periodic putting competition. The as-yet-unclaimed prize for draining a hole-in-one across the office’s stained concrete floors? A bottle of whiskey. ParkMobile, which moved in from the Vinings area, is one of many firms in the financial technology or “fintech” sector flocking to Midtown to avail themselves of what they see as the Atlanta neighborhood’s advantages: proximity to talent pools near universities, specifically Georgia Institute of Technology, and amenities like the restaurants, transit stations and housing options they believe will appeal to the innovators who will be driving their industry forward. NCR plans to put a state-of-the-art headquarters with a street-level “urban living room” to welcome pedestrians and a fitness center and market for employees on a private floor. NCR Corp., the ATM, software and point-of-sale terminal giant, recently broke ground on the vacant lot at Eighth and Spring streets that will become its state-of-the-art $260 million headquarters, which it’s moving in from Gwinnett County. The facility will eventually house 3,600 employees, who will be closer to innovation centers and Hartsfield-Jackson Atlanta International Airport, executives have said. Like ParkMobile, NCR is one of the many firms citing the need to draw so-called “millennials” — those digital natives born after 1980 and said to eschew cars in favor of transit access and value employers with distinct corporate cultures. “They are our target audience,” Mr. Eckelboom said. Leaders from Worldpay, the London-based payments firm, made similar argument when deciding to move their American headquarters into Atlanta from the Sandy Springs building where it had been located since the 1990s. Tony Catalfano, the CEO of Worldpay U.S., said that in the payment-processing space, where a few players own the data rails on which transactions travel, companies must now innovate at other points in the process to break away from competitors. Rapid changes are sweeping the point of sale, the place where a credit or debit card is swiped, tapped or inserted — or in the case of apps like Uber, where the payment method is debited after the ride, he said. 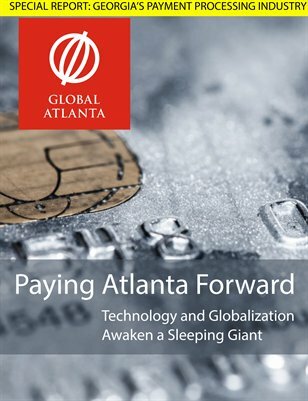 “We’re being a leader in some of that transformation, but we needed to get to a tech-savvy area where I could attract millennials, and I needed to get to a place where more of that innovation is happening,” Mr. Catalfano told Global Atlanta by phone from his new Atlantic Station offices, where Worldpay will soon occupy six floors and plans to eventually grow to 1,200 people from 400 now. Mobile payment platforms like Apple Pay and Android Pay are (slowly) gaining momentum, and stores are beginning to use tablets and phones for checkout to boost convenience and drive conversion. Many big retailers are moving toward acceptance of the EMV standard, long established in Europe, where cards come embedded with computerized chips that dramatically improve security over the traditional magnetic strip used in the U.S.
“We wanted to develop a reputation, which is, ‘Worldpay has the best technology and the best partnership process that is focused on partnering with innovators who are disrupting the point of sale, not buying POS products and competing with you,’” Mr. Catalfano said. Steve Karp, Worldpay’s chief strategy officer, says it was also a realization that the company culture needed to catch up with the times. “We’re not necessarily used to engaging with a bunch of 25-year-olds. They speak differently, they act differently, they think differently. Their expectations for partnership are different, and we’re at least realistic enough to know that we don’t necessarily know how to talk to them,” Mr. Karp told Global Atlanta. More and more, firms are also setting up their own innovation centers with specific budgets to experiment, piloting ideas and products before incorporating them into their mainstream systems. Elavon, another payments company, set up “The Grove” a few years back to look into mobile payments. AT&T last year set up its Atlanta Foundry in Midtown last year as part of a nationwide network of product innovation centers. Other companies like General Motors, Black and Decker and Panasonic Automotive Sensors have set up innovation or IT hubs around the metro area. Worldpay took its partnership approach to Technology Square, a cluster of buildings at Fifth and Spring streets where Georgia Tech has hopped the downtown connector. Home to companies, researchers and economic developers, some are calling it the city’s new center of gravity for innovation. Michelangelo Ho, the ATDC’s “fintech catalyst” whose position was created by Worldpay’s gift, said he’s currently tailoring center’s traditional startup curriculum to the needs of companies like real estate investment platform Groundfloor and card management platform First Performance Corp., signature members of the center, which has graduated 150 companies over 30-plus years. ATDC sees itself continuing to play a key role connecting a virtuous triangle of startups, corporate partners and investors. “What we’re doing here is accelerating the collision of all three groups, and the ATDC is in a good position to help be that catalyst,” Mr. Ho said. Companies like Worldpay want to be a near that intersection to tap into what industry insiders call “serendipity” — chance encounters that can lead to innovation, said Joe Kleinwaechter, vice president of innovation and design. “It gets us access to what they’re thinking, what they’re seeing, what they’re building,” he said of the company’s new location. Blake Patton, managing partner of Tech Square Ventures, an investment fund that often works with fintech companies, said the concept of “open innovation” — working with company-led innovation centers or looking for startup partnerships — is native to tech hubs like Silicon Valley but is only now catching on at the Fortune 500 firms that make up Atlanta’s corporate base. Coca-Cola Co.’s Bridge Program, for instance, aims to integrate technology solutions from Israeli startups into its supply chain globally. Atlanta missed the “first wave of disruption” on fintech innovations like cryptocurrencies and peer-to-peer lending, but that should change as the city’s innovation culture matures, Mr. Patton said. “What you see happening here is what it looks like when it does start becoming an ecosystem,” he said. Atlanta is well positioned because it now has a strong cadre of startup graduates that serve as investors and mentors, a base of corporate giants that will become clients and acquirers for smaller innovators and growing sense of place around around locations like Tech Square, Ponce City Market and the Atlanta Tech Village in Buckhead. Looking out of his Tech Square office at a new student housing high-rise that will include yet another co-working space, Mr. Patton is convinced that this is Atlanta’s moment — both to capitalize on its status as “Transaction Alley,” the nation’s largest hub for payment processing, and for that sector to help fuel other key industry clusters. New trends like the sharing economy and the Internet of Things dovetail well with Atlanta’s strengths in industries like logistics and cybersecurity, and they create new payment challenges like how to authorize a transaction between devices with no person present. “These are all problems that transaction processing has been solving at large scale for years,” Mr. Patton said. Grant Wainscott, director of technology industry expansion at the Metro Atlanta Chamber, agrees that the city’s strength lies in the complementary nature of its tech sectors. Longtime Atlanta technology attorney John Yates of Morris, Manning and Martin says the breadth of Atlanta’s tech industry, underpinned by payments, is starting to attract “bees to the honey” as the city’s reputation grows in the eyes of investors globally. Small fintech players here have unrivaled proximity to big processors, providing a unique advantage over other hubs. A diversity of employers also leads to vibrancy in the tech labor market, especially as the processing comes out of the background. Traditionally not considered as “cool” as consumer-facing brands, payments companies are now pointing out how important their industry is to underpinning the modern economy. “We’re not going to build a brand in a way that a kid at Georgia Tech is going to know who we are because of that, but what we actually do is pretty cool and as relevant in the average of life of every single person as any other industry,” says Mr. Karp of Worldpay. And it’s getting more important as electronic payments become integral to customer satisfaction, whether in apps like Uber and ParkMobile or in more tangible settings like buying a cocktail from the Monsieur “robotic bartender” being developed at Georgia Tech. Traditionally, industries like manufacturing have taken precedence in the eye of political leaders, which Mr. Karp views understandable given that payments firms make their living moving bits and bytes, rather than creating cars or iPhones. That’s now changing with the emergence of institutions in Atlanta that aim to tell the industry’s story to legislators, economic developers, tech investors and the public at large. The American Transaction Processors Coalition launched in Atlanta in April 2014 as a voice in Washington for an industry it says supports 40,000 Georgia jobs directly. It now counts key Georgia congressional leaders — including Rep. Tom Price, R-Roswell, and Republican Sen. Johnny Isakson — among its allies and has worked with the Electronic Transaction Association to drive the creation of a payments caucus in both houses of Congress. Locally, the coalition helped foster PeachPay, a corporate advisory council to Federal Reserve Bank of Atlanta. The Metro Atlanta Chamber is in the process of building a Fintech Task Force — following the model of a similar group on mobility that has seen the city promote itself at the Mobile World conference in Barcelona and bring the North American edition here. The Technology Association of Georgia has a Fintech Society, one of some 30 groups under the umbrella of the 30,000-member nonprofit. At stake in these efforts is not only future expansion of Transaction Alley, but also the ground the city has already gained in the payment processing space, says H. West Richards, the ATPC’s executive director. As Worldpay’s headquarters search shows, global companies are always looking for the most favorable environment, and payments firms don’t have investments in capital equipment tying them down like factories do. To keep what Atlanta has built, Mr. Richards says the city and state should introduce payments-related incentive programs, pass favorable laws, institute training programs to ensure a pipeline of industry talent, maintain healthy incubators and attract investment capital. “We’re either going to do all these things or we’re going to slowly lose all these companies” to aggressive places like Florida and Texas, he said, adding a silver lining to his warning: With the right moves, including a potential designation as a center of excellence for fintech by Congress, Atlanta could become the “crossroads of digital commerce” for the 21st century, he said.